Hannah Frye, pictured above warming media in the neurobiology lab, is doing work that could lead to a treatment for diseases like Alzheimer’s or Parkinson’s. Photo by B.A. Rupert. 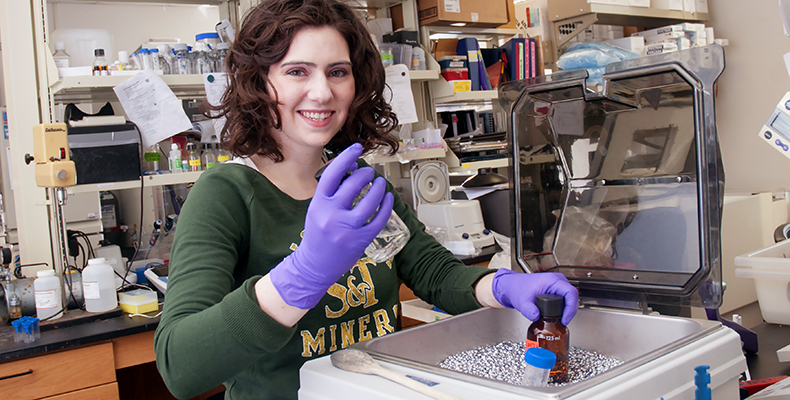 At first glance, it is impossible to tell that Hannah Frye, a senior in chemistry with an emphasis in biochemistry, is helping Robert Aronstam perform groundbreaking research that could lead to treatments for diseases like Alzheimer’s or Parkinson’s. But stop her in the Havener Center at lunch and ask her about her work with the chair of biological sciences and she can explain anything from cell signaling to how she measures the calcium levels in a cell’s endoplasmic reticulum and cytoplasm. 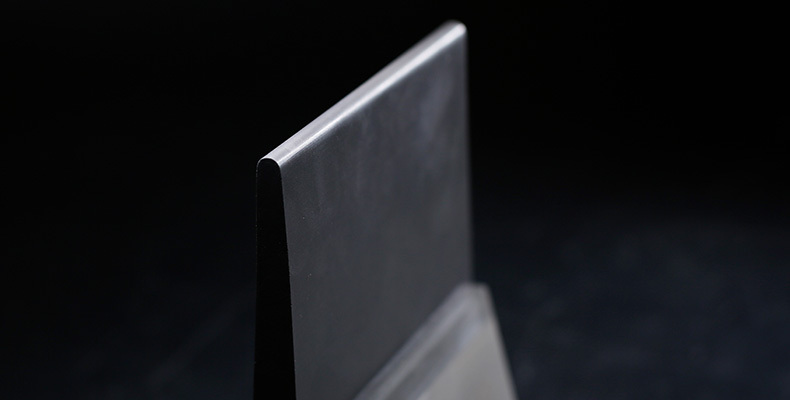 Like an aquatic canary in a coal mine? 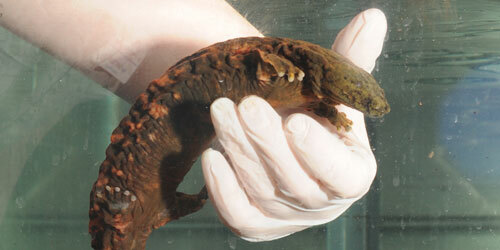 An Ozark Hellbender housed at the Saint Louis Zoo. 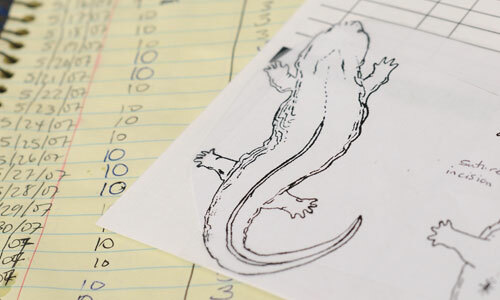 Yue-Wern Huang, an associate professor of biology at Missouri S&T, is trying to figure out where all of the hellbenders went. The hellbender is one of the largest salamanders in the world. They once thrived in the pristine streams of the Ozarks and Appalachia. Now they’re almost extinct. 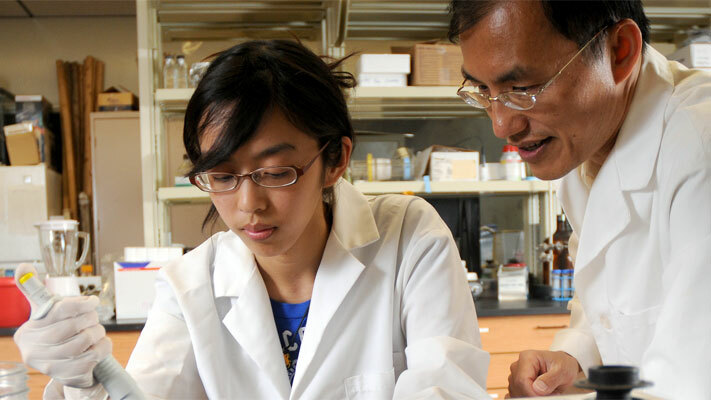 It’s increasingly hard to find them and catch them, but Huang has been taking blood samples from hellbenders for nine years to see if their chemistry is changing over time. His research is funded by the Missouri Department of Natural Resources, the Missouri Department of Conservation, the U.S. Geological Survey, the Environmental Protection Agency, the Saint Louis Zoo, and the Missouri Water Resources Center.